Through the Clean Energy Education and Empowerment (C3E) Program, 52 mid-career women with a range of career backgrounds—from researchers to educators to those in public service—have been recognized for their work advancing and implementing solutions that can transform our global energy system. To celebrate these past and present awardees for the important work they have done in the clean and sustainable energy sector, several hundred energy professionals gathered at Stanford University for the 7th Annual C3E Women in Clean Energy Awards and Symposium held on December 3 and 4. The symposium explored developing trends and innovations in clean energy, such as scaling energy storage, clean energy finance, and sustainable business operation. However, first and foremost, it emphasized what cohost Dian Grueneich, Precourt Energy Scholar and C3E Ambassador emeritus, referred to as the “hallmark of this whole effort”—recognizing women for their achievements across eight professional categories: advocacy, law and finance, business, research, education, international, entrepreneurship, and government. Past awardees and speakers were invited to share their professional journeys and insights to inspire others who are navigating the various stages of their energy careers and the common goal of building a renewable-based, low-carbon energy future. This annual symposium, which began in 2012, brings together women at all career levels to discuss solutions to pressing energy issues while building a strong and interconnected network of energy professionals. The goals of the U.S. C3E program, led by the U.S. Department of Energy (DOE) in collaboration with the MIT Energy Initiative (MITEI), the Stanford Precourt Institute for Energy, and the Texas A&M Energy Institute, are to close the gender gap and increase women’s participation and leadership in the sustainable energy field—subjects that were addressed throughout this year’s symposium. “We have a lot of work to do together,” said Jane Woodward, founder and CEO of MAP, a natural gas and renewable energy investment management firm, in her opening keynote. “We know what we need to do; how are we going to do it?” Throughout the symposium, as speakers and panelists addressed this very question, a common thread emerged: the importance of building and engaging the community in order to transition to a global clean energy system. During the “Scaling energy storage” panel, Betar Gallant, Esther and Harold E. Edgerton Career Development Professor and assistant professor of mechanical engineering at MIT, added that for university students, embarking on a clean energy career path may not be so straightforward. “Clean energy, energy storage, these are not the titles of engineering majors. They are not standalone disciplinary subjects where a student can simply declare, ‘I want to work on that.’ It needs to be more finely honed,” Gallant said. “Students really want to engage and it’s a matter of, are we really giving them the buffet of options to understand how to do that early on?” For students, receiving guidance on which disciplines they can enter to work on different energy solutions can be valuable, she explained. Speakers and panelists throughout the conference discussed the need to engage local communities to promote acceptance of renewable energy initiatives. During the “Powering up the C3E network” panel, Connie Lau, president and CEO of Hawaiian Electric Industries, Inc. and C3E Ambassador, talked about the importance of stakeholder outreach as her company undergoes Hawaii’s largest renewable energy procurement process to date. She cited the necessity of working with developers to ensure that they in turn work in the communities to increase public understanding and acceptance of renewable energy projects. “I feel a sense of kinship—or identity—with all of the women in this room,” said Elizabeth A. (Betsy) Moler, retired executive vice president of government affairs and policy at Exelon as she accepted the C3E Lifetime Achievement award. 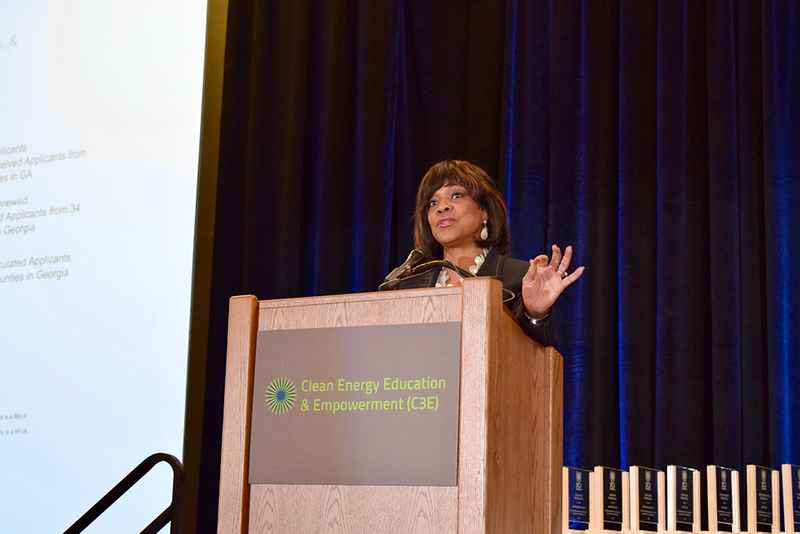 Moler, a former deputy secretary of the DOE and former chairman of the Federal Energy Regulatory Commission, was recognized for her long history of clean energy leadership and role as a vocal advocate for encouraging women to take leadership positions in the energy industry. This year’s C3E Symposium also celebrated the achievements and work of Melanie Santiago-Mosier, program director for access and equity for Vote Solar (Advocacy Award); Elizabeth Wayman, an investor at Breakthrough Energy Ventures (Business Award); Lilo Pozzo, Weyerhaeuser Associate Professor of Chemical Engineering at the University of Washington (Education Award); Molly Morse, chief executive officer and co-founder of Mango Materials (Entrepreneurship Award); Aimee Barnes, senior advisor to California Governor Edmund G. Brown, Jr. (Government Award); Tania Laden, executive director and co-founder of Livelyhoods (International Award); Lauren Cochran, managing director of Blue Haven Ventures (Law & Finance Award); and Alissa Park, director of the Lenfest Center for Sustainable Energy at Columbia University (Research Award).